If you are looking for a specific Parish, you may want to try searching for it. In Worcestershire in time of Domesday Book, soon thereafter considered in Staffordshire (S.Seisdon Hundred). For civil purposes transferred in 1844 to Worcestershire (Halfshire Hundred). All the censuses between 1841 and 1901 are now available on a number of fee-paying (Subscription or PayAsYouGo) sites including Ancestry.co.uk, FindMyPast.co.uk, thegenealogist.co.uk and genesreunited.co.uk. The 1911 census is available in full or in part on some of these sites. We are unable to advise on the choice of site since researchers' personal preferences will be influenced by the content and search facilities offered by each site. Some sites offer a free trial. Access to the library edition of Ancestry.co.uk is widely available at most record offices, including Worcestershire Archives, and some libraries. You are advised to book time on their computers before making a visit. A free-to-view site is being developed at freecen.org.uk for the 1841, 1851, 1861, 1871 and 1891 censuses. Coverage of Worcestershire parishes is rather sparse at this time. Census returns can usually be viewed at Church of Jesus Christ of Latter Day Saints' Family History Centres. The records of schools and other educational establishments in this parish are detailed in a handlist available at Worcestershire Archives. The list refers to original documents so you will need to note the reference number and contact staff. CLENT, a parish in the southern division of the hundred of SEISDON, county of STAFFORD, though locally in the lower division of the hundred of Halfshire, county of Worcester, 3¼ miles (S. S. E.) from Stourbridge, containing 885 inhabitants. The living is a vicarage, with the perpetual curacy of Rowley-Regis annexed, in the archdeaconry and diocese of Worcester, rated in the king's books at £8. 16. 5½ and in the patronage of the Crown. 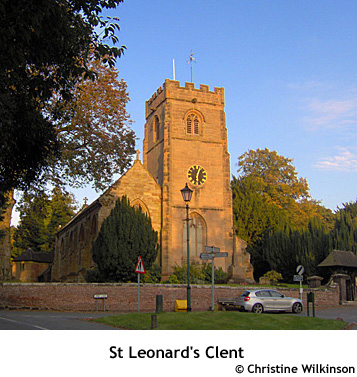 The church is dedicated to St. Leonard. There are places of worship for Baptists and Wesleyan Methodists. The infant king of Mercia, St. Kenelm, is supposed to have been murdered here in 819, by order of his sister Quendrida, but the body, having been subsequently discovered, was buried in Winchcombe abbey, which had been founded by his father. Here is a free school for the children of poor parishioners, founded by John Amphlett, Esq., in 1704; the master, who instructs thirty children, has a house to reside in, with a garden attached, and the interest of £200, A Sunday school was also commenced, in 1788, by Thomas Waldrou, Esq., who supported it during his lifetime, and at his death, in 1800, bequeathed £500 for that purpose; eighty children receive instruction.